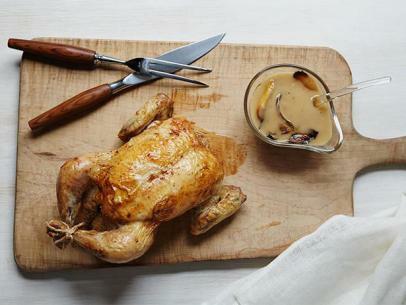 New cooks are intimidated by the idea of roasting a chicken, but nothing could be simpler. 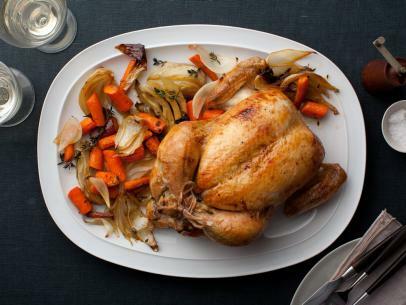 If you roast the chicken with some vegetables in the same pan for about an hour, you will have a moist, golden bird and savory accompaniments — all ready to eat at the same time. While they cook, you can set the table, watch the news, maybe make a dessert. Preparing the Vegetables Peel the carrots and cut them crosswise into 1 1/2-inch-long pieces. Cut the thicker pieces in half lengthwise as well. Peel each onion and cut into quarters. Wash the potatoes under cold water to get rid of any dirt. Leave them whole and unpeeled. 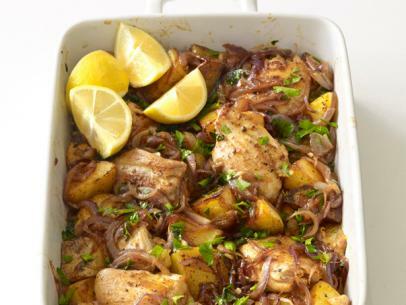 Scatter the carrots, onions, and potatoes on the bottom of a 9-by-13-inch baking or roasting pan. Sprinkle 1 1/2 teaspoons of the salt and 1/2 teaspoon of the pepper over them, and lay 2 sprigs of the rosemary on top. If you are using dried rosemary, put 1 tablespoon in the palm of your hand and crumble it over the vegetables. Preparing the Chicken The giblets, which consist of the liver, gizzard, and heart, plus the neck, are usually in a package inside the cavity of the chicken, between the legs. Remove them and discard or refrigerate them to use later. If there is a pale-yellow chunk of fat on either side of the cavity, pull or cut it off and discard. Hold the chicken under cold running water and rinse it inside and out. Shake off excess water and pat dry with paper towels. 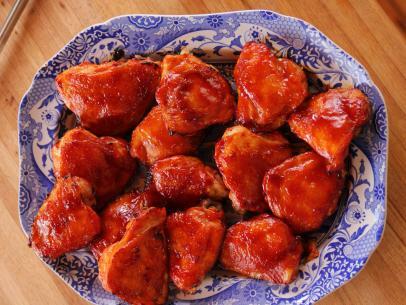 Sprinkle the remaining 11/2 teaspoons of salt and 1/2 teaspoon of pepper over the outside of the chicken, rubbing them all over the skin. Set the chicken, the breast side facing up, on top of some of the vegetables, with the remaining ones surrounding the bird. Insert a dial-type (not instant-read) thermometer into the breast, taking care that the rod of the thermometer does not touch any bones. Roasting the Chicken Put the chicken in the center of the oven and set the timer for 30 minutes. 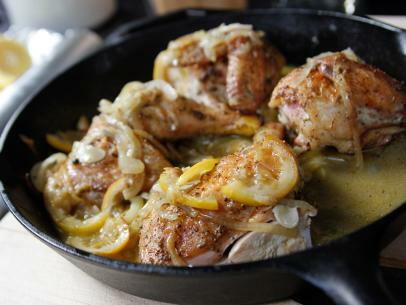 When the timer rings, remove the pan from the oven and, using a large spoon, turn over the vegetables that surround the chicken. Don't bother with the vegetables under the chicken. Return the pan to the oven and set the timer for 30 more minutes. 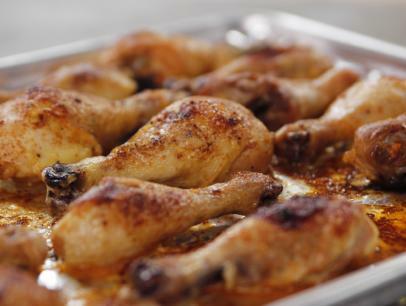 After 30 minutes, take the chicken out of the oven to check for doneness. Insert the tip of a small paring knife into the meat of the thigh where it attaches to the body. If the juices that run out are pink, the chicken needs to continue cooking for another 10 to 15 minutes. If the juices are clear, it is done. 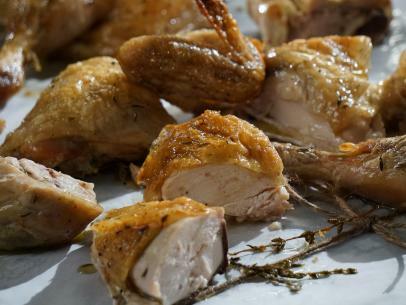 The meat thermometer should show a temperature of 170 degrees F to 180 degrees F when the chicken is done. Carving the Chicken Carve the chicken according to the instructions on the preceding page. Scoop the vegetables out of the roasting pan and onto a serving platter. Remove the fat from the pan juices. 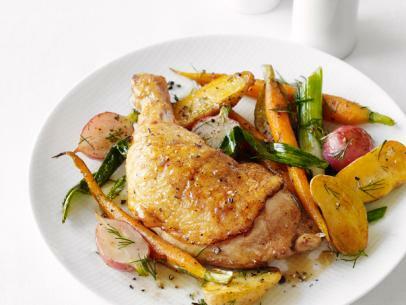 Arrange the cut chicken pieces on top of vegetables, spoon some pan juices over the chicken and vegetables, scatter the 2 remaining rosemary sprigs on top and bring the dish to the table for serving.